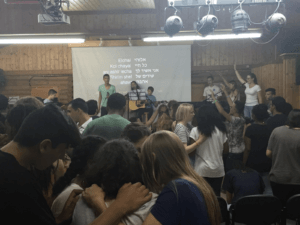 The Dor Haba Camp is a worship training camp that takes place every summer. 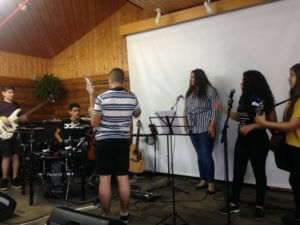 Musicians and worship leaders from the U.S. and Europe join with local teachers and musicians to train local Israeli, Jewish and Arab youth on various instruments, voice, video production and sound. At the camp, everyone is split up into worship teams. They prepare worship together and each team takes a turn leading worship during the final youth worship night. 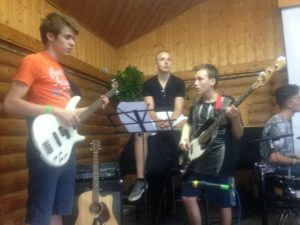 There is usually an open mic night at the camp where anyone can share a special song, or a song they wrote. There are workshops in the afternoons on topics like teamwork, recording music, spontaneous singing, prophetic worship, different styles of music in worship, Middle eastern music, song writing, how to lead a scripture-based prayer meeting with worship and how to use music to study God’s word. The heart of the camp is to see each young person develop a lifestyle of prayer and worship in their own personal day-to-day lives. And for them to become excited about pressing into intercession and prayer for what God is doing today in the earth and for the great harvest which is yet to come. For them to realize they can use their creativity, gifts and talents to glorify God and to impact the culture around them. And all this happens together with their Arab or Jewish brothers and sisters, as they learn more about each other and how to serve together in bringing His Kingdom to the Middle East. You can check out pictures and video from past camps if you click on the scroll down botton “Dor Haba Camp” in the top menu. A 16 yr. old Jewish Israeli girl shared that before she came to the camp it was hard for her to read her Bible or to enter into worship. But at the camp after one of the leaders prayed for her something broke through in her heart and since she came home from the camp she can’t put her bible down. Another 15 yr. old Jewish girl said she got so blessed at the camp and God really ministered to her heart especially as people prayed over her and gave her prophetic words. She said it was such a special camp and she feels in her heart it’s the start of something new happening among young people in the body of messiah in Israel. An 16 yr old Arab guy from Gaza said at the camp it is the first time that he felt love from Jewish believers and was the first time he could truly love them and know them as brothers. 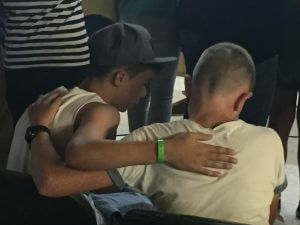 He had come to the camp afraid they would look down on him or be suspicious of him, but he found just the opposite and became good friends with them.